Someone should remind the Donald that he actually is President and that it’s high time he accomplished something. Anything. Back on April 21st, for example, he promised that a core feature of his platform — a sweeping, pro-jobs tax reduction — would be soon unveiled. Well, we’ve passed the eighteenth Wednesday since that promise. What was actually delivered back then, of course, was a one-page statement of vague principles, fond aspirations and apple pie. So in Springfield, Missouri this week, the Donald is launched tax reform efforts again. And yet again the White House spin brigade has already made clear that it’s all about tone, not substance. That is, he will orate about tax fairness and closing loopholes, but not name any. He will promise big rate reductions but not say how big and for whom. He will promise to liberate jobs by slashing the corporate tax rate without explaining exactly why that will result in more jobs rather than more stock buybacks. And there were no numbers about how the implied trillions of revenue lost over the next decade will be paid for. Instead, Donald puckered himself up into a meld of Huey Long and Jack Kemp while preaching up a storm in favor of the “little guy”. A reference to the average worker who purportedly is being crushed by the Federal income tax and who gets tangled in the complexity of the IRS code without a high-priced tax lawyer alongside loophole-savvy financial advisors. Accordingly, the Donald is going to “unrig” the tax code for these little guys, thereby keeping faith with the millions of dispossessed citizens of Flyover America who voted for him last November. Except that narrative is essentially nonsense. This isn’t 1981. There is no raging inflation and bracket creep propelling the middle class into tax tyranny. In fact, owing to indexing and large increases in the standard deduction and personal exemption over the last 35 years, the income tax has essentially morphed into a Rich Man’s Levy. The Donald’s song and dance about tax simplification and reduction comes right out of the well-thumbed GOP hymnal. It speaks little to the blue collar folks — in places like the western Pennsylvania steel country, industrial Ohio, the Michigan auto belt and the manufacturing towns of Wisconsin and Iowa — who on the margin accounted for his electoral college victory. Trump’s tax reform airball will promise to make filing with the IRS more palatable to tens of millions of citizens who, apparently, find it inconvenient to shell out $25 to file their Federal income tax return with TurboTax. Among the 148 million income tax filers, the bottom 53 million owed zero taxes in the most recent year (2014), and the bottom half (74 million) paid an aggregate total of just $45 billion. That amounted to just $8 per week per filer. If you take all filers with AGI (adjusted gross income) under $100,000 per year, you end up with 122 million taxpayers or 83% of the total. Upwards of 85% of this group uses the standard deduction. So they are not caught up at all in the puzzle palace of IRS code that the Donald denounces. The 122 million taxpayers — who make ends meet on less than $100,000 of income — paid a total of just $278 billion in income taxes during 2014. That was just 6.5% of their $4.3 trillion of AGI. To be very clear, there was still $4 trillion left in the collective pockets of these 122 million taxpayers — even after the IRS had its way with them! Even if a Keynesian demand side tax cut was a good idea, which it isn’t, the fact is there is not much more that could be put “back in their pockets” by income tax cuts. 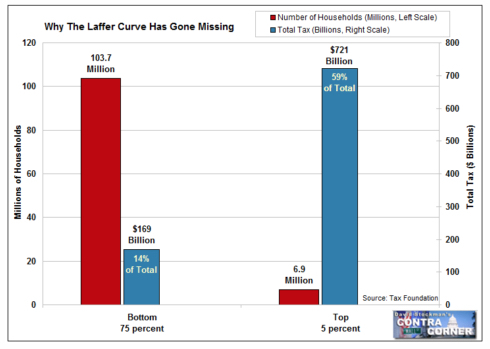 The truth is that the Laffer Curve has gone missing. At average tax rates of under 7%, the bulk of US wage and salary workers (83%) are not facing prohibitive disincentives to work or production. By contrast, the top 4% or 6.2 million filers paid $802 billion in Federal income taxes. That amounted to nearly 58% of total Federal income tax payments, and resulted in an average tax rate of 24% on the group’s $3.3 trillion of AGI. That’s not to object to putting some of that $802 billion back into the pockets of the top 4%. Many of them are small businessmen and the proverbial” job-creators” who make the economy grow, and who also file sub-chapter S business taxes. But incentivizing the job creators in this manner should not be financed on the backs of future taxpayers via borrowing. It must be paid for with spending cuts as a first resort, and less onerous taxes — such as consumption taxes or VAT (if necessary). The Fed has generated such gigantic financial bubbles and caused all financial assets to become so massively overvalued that incentives for the rich are not really in short supply. Federal Reserve Chair, Janet Yellen and the other Keynesian economists on the Fed have generated more “trickle-down” wealth and rewards than the Gipper could ever have imagined back in 1981. The $45 trillion in household wealth gains since the 2009 bottom vastly overshadows any possible benefits from lower tax rates, even at the top of the income ladder. Even Trump’s Goldman duo of Gary Cohn and Steven Mnuchin are saying that there will be no “net cut” for the top tier of households. If the bottom 83% don’t pay much tax in the first place, and if the top 4% who pay most of the taxes are not to be indulged for social policy/equity purposes, what’s the point of the whole income tax cut charade? The Goldman geniuses are chasing themselves in a circle trying to cut the rates and broaden the base. But what it actually amounts to is amateurish stumbling around the K-Street corridor where every single “loophole” they propose to close is shot down. The truth is, there are no politically viable loopholes that can be closed which will generate a dimes worth of “payfors.” There is no tax rate cut for mainly the rich that can pass the Congress if it is not to be financed by adding trillions more to a soon be $30 trillion national debt. This tax cut charade is getting ludicrous. It’s turning into Seinfeld on the Potomac — a big, noisy show about nothing. (Chart data is slightly different because it’s for 2013, while the above data is more current for 2014. But the extreme skew to the top is still the same). The chart below is the key to the real tax problem in America and explains why the Donald is missing his policy and political targets by a mile. What is killing jobs and shrinking paychecks in Flyover America is the $1.2 trillion Federal payroll tax. It amounts to 15.3% of every payroll dollar up to $127,000 a year, paid 50/50 by employer and employee; and constitutes a destructive wedge on the middle and lower levels of the jobs ladder. It raises the employers’ fully-loaded payroll cost precisely where the China Price (imported goods), the India Price (off-shored services) and the Robot Price (capital substitution) put immense competitive pressure on domestic, lower-wage jobs. As shown in the graph below, nearly 80% of all US jobs (121.0 million), which were subject to payroll tax withholding in 2014, generated pay of less than $57,000 per year, and nearly 60% (91.2 million) paid less than $35,000 per year. Yet the payroll tax extracted $410 billion from these jobs on a combined employer/employee basis. In the case of the average $14,500 wage in the bottom quintile of earnings, for example, the employee had $1,100 extracted from his/her paycheck, while a like amount was added to the employers cost of production. At the $35,000 level at the top of the lowest quintile, the extraction was nearly $2,700 each. 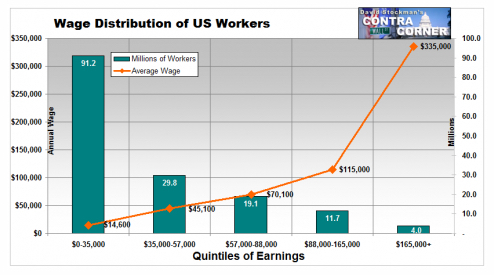 And for the $45,100 average wage in the second quintile, the extraction would have been $3,459 each. Laying on thousands of dollars of payroll tax costs on already noncompetitive wage rates is an invitation for employers to go off-shore or to automate. By driving interest rates to rock bottom, they have drastically lowered capital costs way below market clearing levels, sharply improving the “payback” economics of automation and robots. At the same time, they never cease to drive nominal wages and domestic living costs ever higher in pursuit of their destructive 2.00% inflation target. An across the board income tax cut from the GOP faithful can’t hold a candle to the economics and politics of slashing the payroll tax, and financing the revenue loss with spending cuts and/or a tax on consumption. For example, a four-person family earning the $35,000 level at the top of the first quintile would face a $5,355 combined payroll tax extraction, but would pay only $600 in income tax under current law. That’s because the first $29,000 of its income would not be taxable owing to the standard deduction ($12,600) and personal exemptions worth $16,000 ($4,050 each). Cutting the income tax paid at the bottom of the job ladder can’t hold a candle to alleviating the crushing burden of payroll taxes. Likewise, even a taxpayer at the top of the second percentile earning $57,000 (and thereby encompassing 121 million wage earners) would pay only $3,300 in income tax compared to an extraction of nearly $8,720 for payroll taxes. Indeed, even at the $100,000 AGI level, the payroll tax extraction of $15,300 would still vastly exceed income tax liability of $9,700 for a family of four taking the standard deduction and personal exemptions. As we said, the Donald is barking up the wrong tree on taxes. The real story is not that US taxes are way too high in the aggregate. Even if you do believe, as we do, that shrinking both the size of government and the tax burden is always he right thing to do, the fact remains that relative to the rest of the OECD (developed world) the US tax burden from all levels of government relative to GDP is quite low. In fact, at 26% of GDP the total US tax burden is well below the 34% OECD average and far below the 40-50% levels which pertain in the socialist utopias of Europe. The real problem is that we are taxing the wrong thing. Consumption taxes account for 33% of the revenue take on average in the OECD compared to just 17% in the US. If the Donald really wanted to address the economic pain in Flyover America he would slash or eliminate the payroll tax and replace it with a VAT. Even the mild semblance of a VAT represented by the BAT (border adjustment tax) has already been killed by the K-Street lobbies and the GOP Senate. Making it logical to believe there is no obvious way forward for rational tax reform, either. The entire corporate income tax is a stupid, essentially uncollectible relic of a bygone age when industrial America was riding high. In the context of the current Bubble Finance regime at the Fed and other central banks, it would result in more stock buybacks and other distributions to Wall Street. And that’s not what the Donald got elected on, either. 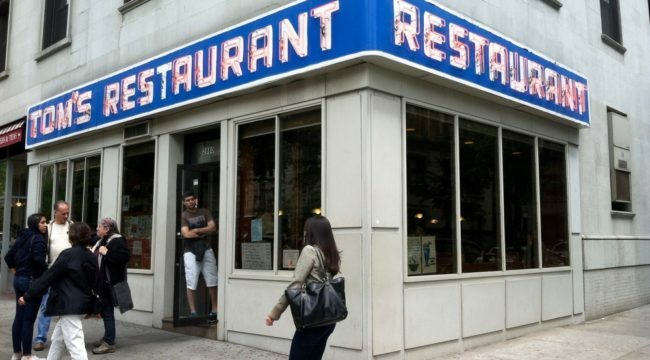 When it comes to the tax cuts and tax reform, we are talking pure Seinfeld: A long-running show about exactly nothing that matters.